Among lots of historical landmarks in Japan, Kinkakuji is quite famous. Let’s look back on the history of Kinkakuji. Kinkakuji dates back as far as the Kamakura period when Fujiwara Kintsune, or Saionji Kintsune one of the Fujiwara clan build the Saionji temple at that place. After the Kamakura Shogunate was overthrown, Shogun Ashikaga Yoshimitsu received a desolate Saionji and transformed it into a grand-scale residence, which was called Kitayamadono (Kitayamatei). Although it was called “residence,” its large scale was equal to the size of the Imperial Palace and Yoshimitsu had seized political power at the villa. When Yoshimitsu passed away, the Kitayama mountain villa was taken apart and only the Shariden (Kinkaku) part was left to be a Zen temple in accordance with his will. The temple was named after by taking two characters from Rokuonindono, the posthumous Buddhist name of Yoshimitsu. In the year of 1950, all Japanese people were shocked by the news that Kinkakuji, known worldwide at that time, was destroyed by arson. This incident expanded to more than the suicide of the arsonist’s mother or even the issue of The Temple of the Golden Pavilion which was based on the incident written by Yukio Mishima, a novelist representing Japan. Yukio published the novel and many shrines and temples in Kyoto started to install fire extinguishing equipment, triggered by the accident. If you are interested, do read through the novel. 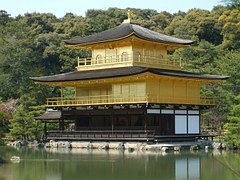 You can also learn the history of Kinkakuji. Kinkakuji is very much popular and there is no one but knows it. 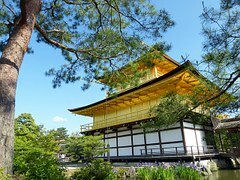 It not only has a long history but it is always crowded as a representative sightseeing area in Kyoto. Speaking of the sights of Kinkakuji, different architectural styles are adopted in the lower, middle and top stories. The top two stories are covered with gold leaf. Putting on shining gold foil, it glitters more on sunny days. It’s so gorgeous and shines dazzlingly that a great many tourist choose it as a photo spot. If you like paintings, we recommend sketching the pavilion. Let’s see the pond that reflects the graceful Kinkakuji on its surface in every season. Each season shows different colors of the temple and every season has its own atmosphere. The golden pavilion is beautiful as well when it is covered with snow. Don’t forget to visit when you are in Kyoto! Ginkakuji | Contrary to its name it’s not plated in silver!